I just saw Bridget Jones Baby with my sisters this week, and Colin Firth is as bae-ish as ever. 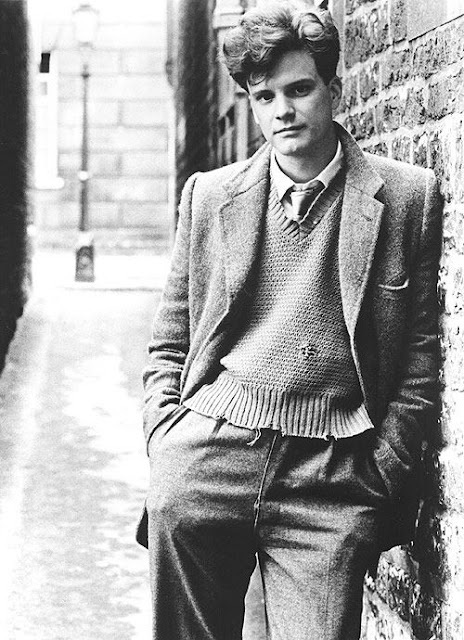 Still as charming as in this photo of him as a 21 year old, early in his acting career. I am also drawing inspiration from his outfit here - I love the combination of the distressed pullover with the neatness of the trouser, shirt, and blazer combination. Beautifully done. Playing it up with some Doc Martens would be fun for a homage to the rude boy aesthetic. Oh Colin, always offering ample wardrobe and swoon inspiration!